The Arenas Bridge was the longest span built in Puerto Rico during the Spanish Colonial period. Designed by Mariano Sichar, who was then the District Engineer at Ponce, the 23,623 pound steel truss was built in 1894 by the prominent Belgian firm of Nicrisse and Decluve for 56,221 pesos. The bridge was transported to Puerto Rico on the steamboat Teutonia. José Roque-Paniagua oversaw the constuction of the stone abutments, and prominent engineer Julio Larrinaga supervised assembling the bridge. This is the most important metal bridge in Puerto Rico from the period. The Arenas Bridge was built as part of the Carretera Central, the first highway across the central mountains of Puerto Rico. 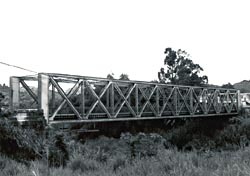 The Arenas Bridge, which is still in use, spans the Plata River on PR-735, Km. 1.3, between the towns of Caguas and Cayey, Puerto Rico.